The playlist for the November 30, 2011 broadcast of the Swing Shift Shuffle has just been added to the playlist filing cabinet. The weekly Red Hot Lindy Hop lesson and session continues this Friday night at the Rumba Room with a lesson by Mike T. and Michelle and music by Mike T. Free admission before 7:00 p.m., and $5 at the door afterwards. Next week, the kind folks at RHLH invited me to take another at spinning the tunes, so hop on down and say "Hello, Joe! Whaddaya know?" I'm taking a week off to make my holiday preparations, but I'll be back on December 5. Some basic SSS operations will continue, like the playlist posting and notice of any imminent and interesting event. 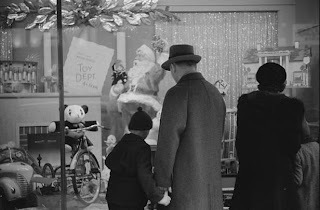 In the meantime, I hope everyone has a careful, courteous and safe Black Friday. The above family from Providence, Rhode Island in 1944 has started their holiday shopping. Courtesy of the Library of Congress American Memory Collection. Thanksgiving, 1942. American workers give up the holiday to speed victory. The Blackwelder family celebrated Thanksgiving at their benches in a Glenn Martin Company plant. 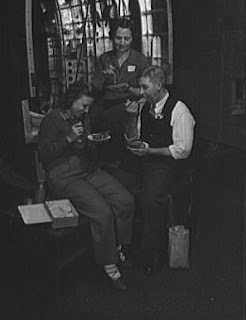 William P. Blackwelder works in the tool crib of the plane factory, and his wife and daughter are riveters. A son, Frank, in the Navy for one year, has been wounded four times. He has been awarded several medals. The playlist for the November 23, 2011 broadcast of the Swing Shift Shuffle has just been added to the playlist filing cabinet. 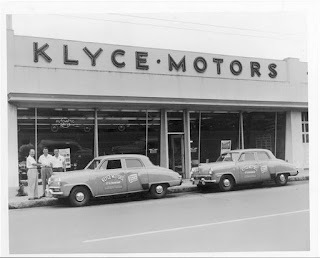 Memphis' own Vance Lauderdale posted this interesting bit of lost Memphis on Ask Vance. 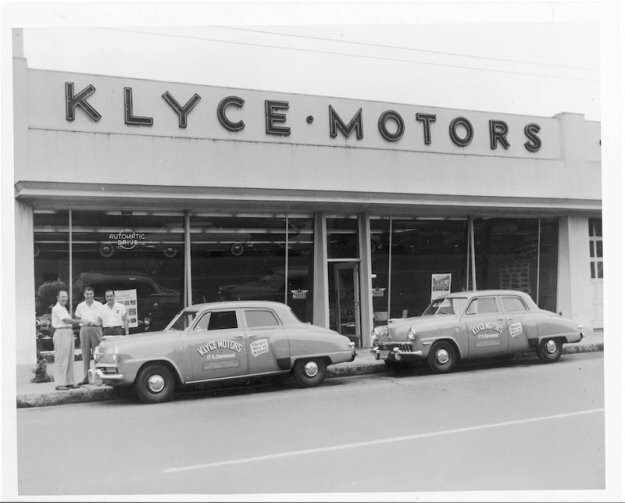 Aside from the building itself, the photo features two 1949 Studebaker Commanders in the Klyce Motors livery. This morning's Sunrise Serenade was "Dinah" by Bing Crosby and the Mills Brothers. Enjoy the video below from YouTube. The Red Hot Lindy Hop will be sleeping off the turkey and dressing this Friday, but it will return to the Rumba Room next week with a lesson by Mike T. and Michelle and music by Mike T.
I started following a comics blog called Four Color Shadows, and it did not take long for me to find something worthy of a post here. As far as I can tell, Gale Allen and the Girl Squadron is about an all female space patrol that operates from Venus. According to FCS, this 1940s title was drawn by female artist Fran Hopper. In this episode, the Girl Squadron saves the inhabitants of a nearby planet from enslavement by a villian using a mind-altering gas. This morning's Sunrise Serenade was "By The River Sainte Marie" by Johnny Mercer. Click on the song title for a sample from emusic, or click here for the album page. It is that time of year again! This Thanksgiving, we are again inviting the great Tex Avery to tell the classic story of a simple Pilgrim looking for that first Thanksgiving Day meal, and throw in a pack of World War II era jokes to boot. From the Internet Archive, the 1945 animated short, Jerkey Turkey. The Majestic Grille is starting its Sunday Supper & A Movie series again for the holidays. In addition to the regular menu, there will be some holiday specials. Special menus available at 6:30 p.m., and the movies start at 7:00 unless otherwise indicated. For more information, check the Majestic's Events page. Having worked at the WEVL Music Factory for some time, I am familiar with personnel manuals, policies, etc. 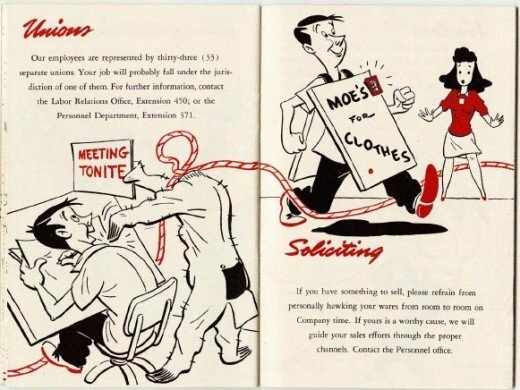 I can safely say that this employee handbook from Disney Studios in 1943 (posted on How To Be A Retronaut) is one of the most human Human Resources resources I have ever seen. The terms and conditions of employment were nowhere near as Dickensian as I would have presumed for 1943, especially considering that Walt Disney was engaged in war work making training films, etc. for the military. In fact, I would wager that these policies are better than many present day employers, with one obvious exception. While this manual is certainly light-hearted, it depicts rather ardent gazes by the male employee at his female co-worker that might not survive a modern sexual harassment policy. The same would go for the fact that female employees got twice the number of sick days as male employees, although to be fair, the women were not eligible for membership in the Penthouse Club. "Men only! Sorry, gals. . . ." That is a direct quote from the handbook on that point. Today's Sunrise Serenade was "Apple Honey" by Woody Herman and His Orchestra. Click on the song title to listen courtesy of Jazz On Line. The playlist for the November 16, 2011 broadcast of the Swing Shift Shuffle Fall Pledge Drive Special "Eat, Drink and Be Members" has just been added to the playlist filing cabinet. Years ago, I once saw a Stout Scarab in the flesh/sheetmetal, and I thought it was one of the coolest vehicles ever built. In fact, I am little surprised to find that I have not posted about it before, but I can find no previous reference to it on the SSS. 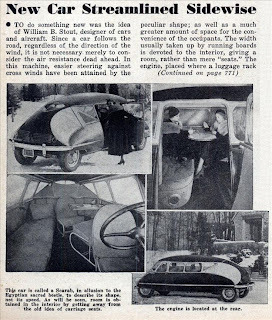 Allow me to correct that oversight with this article from the June 1935 issue of Science & Mechanics, posted on Modern Mechanix, which describes the car's many advanced features. Sunrise Serenade: Beans And Cornbread - Plus Pledge Drive Special! This morning's Sunrise Serenade was "Beans And Cornbread" by Louis Jordan and His Tympany Five. It was probably floating through my unconscious this morning because it is on the playlist for tonight's Swing Shift Shuffle Fall Pledge Drive Special: "Eat, Drink and Be Members" featuring music about food and eating. I hope you will join me tonight and make a pledge to support WEVL. Enjoy the video below from YouTube. You will wear out your shoes this week. 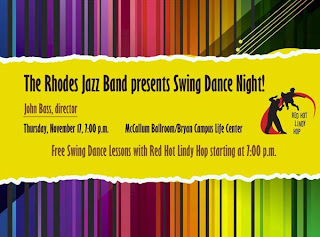 The Rhodes Jazz Band presents Swing Dance Night this Thursday, November 17 at 7:00 p.m. in the McCallum Ballroom of the Bryan Campus Life Center. 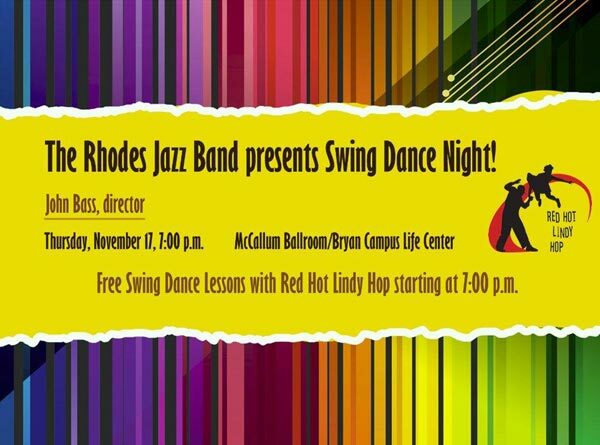 The Red Hot Lindy Hop will be there offering free swing dance lessons. Then on Friday, the weekly lesson and session continues at the Rumba Room with a lesson by Kirk and Meghan and music by Alexis. Free admission before 7:00 p.m., and $5 at the door afterwards. Today's Sunrise Serenade was "The Yam" by the Mills Brothers. Click on the song title to listen courtesy of Jazz On Line. The first "Saint" I remember is probably the most recognizable: Roger Moore playing Simon Templar (the Saint) in the early 1960's television series. I also remember a late 1970's television series called Return of the Saint, and of course there was the 1997 movie with Val Kilmer in the title role. My favorite Saint is unquestionably George Sanders, from the series of movies in the 1930's-40's. I never knew there was a comic book version, but I am not surprised. 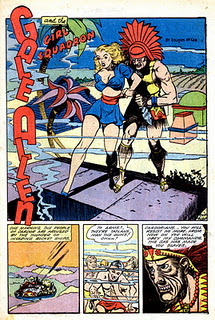 Pappy's Golden Age Comics Blogzine posted this 1949 issue of The Saint featuring a story entitled, "The Saint Breaks A Spell." This morning's Sunrise Serenade was the hearty "Rump Steak Serenade" by Fats Waller and His Rhythm. Click on the song title to listen courtesy of Jazz On Line. On this Veterans Day weekend, we have a tale of inter-service relations, with two sailors fighting to join the Army. From the Internet Archive, starring Popeye the Sailor, here is the 1936 animated short: I'm In The Army Now. 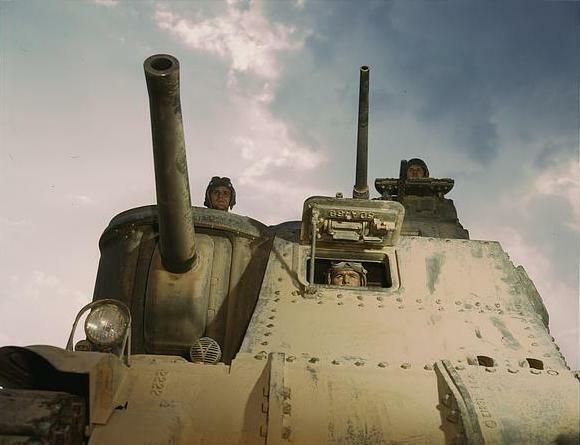 Happy Veterans Day and a well deserved thanks to our nation's veterans, like this M-3 tank crew in 1944 from the Library of Congress American Memory Collection. When I awoke this morning, I remembered that today was Veterans Day. Almost instantly, this song started playing in my head. Today's Sunrise Serenade was "There'll Be A Hot Time In The Town Of Berlin" by Bing Crosby and the Andrews Sisters. Click on the song title to listen courtesy of Jazz On Line. BBC News posted a very interesting article about the discovery and excavation of a World War II RAF Spitfire that crashed into an Irish bog in 1941. Despite the damage from the crash, the properties of the peat bog preserved the remains of this vaunted British aircraft. 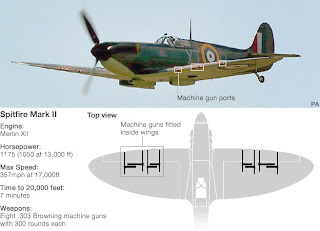 The diggers were able to recover six of the eight Browning .303 machine guns carried in the wings. Experts cleaned and reassembled one complete gun using the workable parts from all six, and after 70 years, it still fires. There is a great video of the excavation and test firing. The gun fired without a hitch. There can be no greater testament to the machinists and engineers in UK factories in the 1940s who, despite churning out guns at the rate of thousands per month, made each one of such high quality that they could survive a plane crash and 70 years underground and still fire like the day they were made. Today's Sunrise Serenade was "Henderson Stomp" by Benny Goodman and His Orchestra. Click on the song title to listen courtesy of Jazz On Line. The playlist for the November 9, 2011 broadcast of the Swing Shift Shuffle has just been added to the playlist filing cabinet. 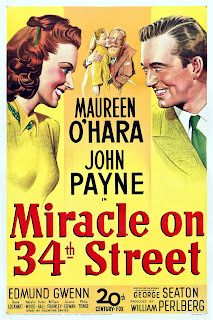 With all this talk about bankers and finance in the news of late, Matinee at the Bijou posted a relevant double feature. 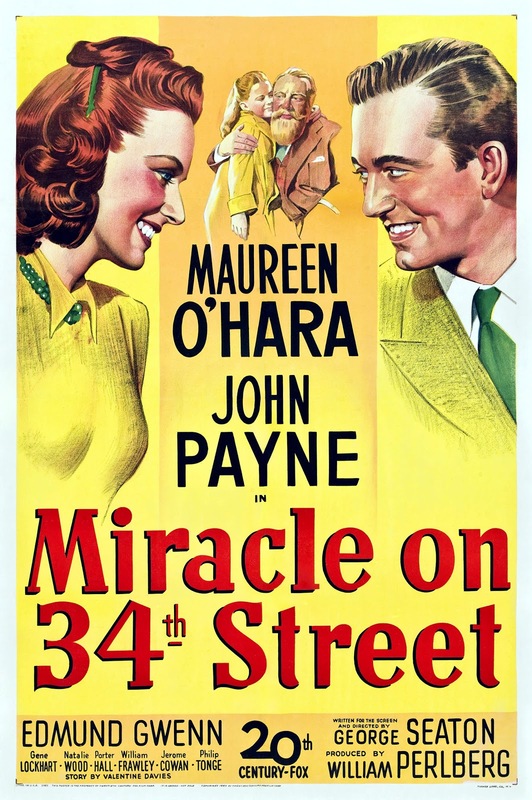 Money Madness discusses Hollywood's portrayals of bankers and other men of means in film (think Mr. Potter in It's A Wonderful Life). In Hollywood Babylon to Wall Street Jungle, MATB reveals the second career of actor Richard Ney. 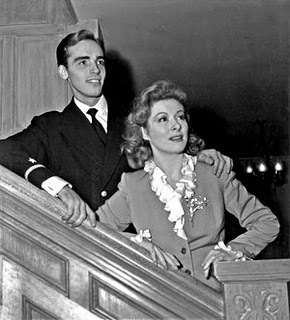 He played Greer Garson's son in Mrs. Miniver, and her husband in real life, at least for a time. His second career was that of a successful author on the financial world. In the early 1960s, Ney began transitioning out of the film and TV entertainment business and into something else altogether. With an economics and public finance degree from Columbia University in New York, he opted to move into the financial world. But instead of just being a financial consultant or market advisor, Ney started writing about Wall Street, achieving national notoriety for accurately predicting the 1962 stock market crash. This morning's Sunrise Serenade was "The Man I Love" by Billie Holiday and Her Orchestra. Click on the song title to listen courtesy of Jazz On Line. The weekly Red Hot Lindy Hop lesson and session continues this Friday night at the Rumba Room with a lesson by Becky & Michael Q and music by Michael Q. Free admission before 7:00 p.m., and $5 at the door afterwards. This post on the Hemmings blog represents a confluence of interests for me. In its continuing series of street scene photographs featuring now antique autos, Hemmings selected a these shots from the Library of Congress Gottlieb collection, merging classic cars and swing history. 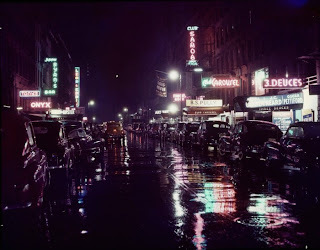 Jazz writer and photographer William P. Gottlieb spent plenty of time on “Swing Street,” that section of West Fifty-Second Street between Fifth and Sixth avenues in Manhattan where many jazz clubs were located in the ground floors of brownstones, so it was only natural that he go outside and shoot the street in its entirety. This morning's Sunrise Serenade was "I'll Always Be In Love With You" by Ella Fitzgerald. Click on the song title for a sample from emusic, or click here for the album page. This cartoon seemed appropriate for the changing leaves and cool weather. In this 1934 animated short from Ub Iwerks, a young grizzly bear ignores the warnings of Jack Frost, and underestimates the chilling power of Old Man Winter. Carl Stalling, of future Warner Bros. fame, provided the musical score. From the Internet Archive, here is Jack Frost. As noted by Peta Pixel, and posted on How To Be A Retronaut, from 1944 to 1946, the U.S. 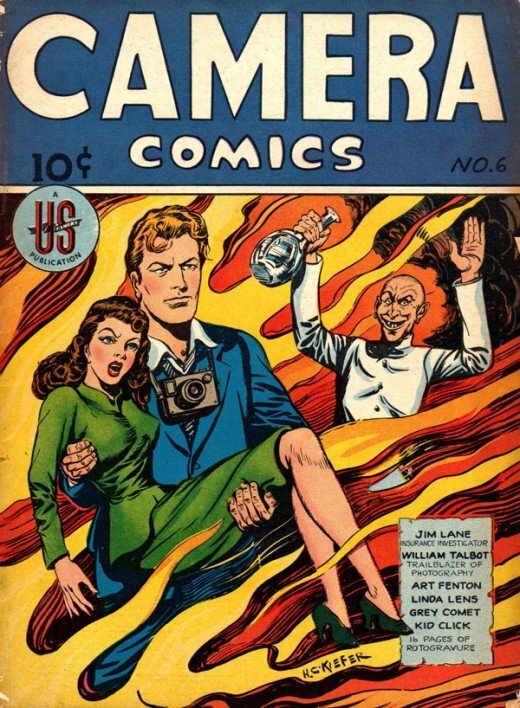 Camera Publishing Company issued a series of comic books to get kids interested in photography. 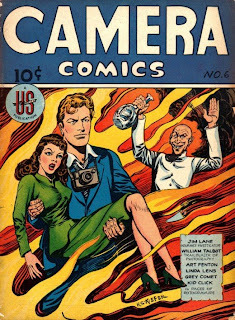 These Camera Comics books featured stories of photographers in wartime, crime fighting and other adventures; as well as stories about pioneering figures in the history of photography. The fictional characters included Linda Lens, Kid Click, and my favorite, "Jim Lane, Insurance Investigator." I wonder if he was Lois Lane's brother. There were also some neat ads for Kodak and Graflex showing the role their products were playing in the war effort. Today's Sunrise Serenade was "Nightmare" by Cab Calloway and His Orchestra. Click on the song title to listen courtesy of Jazz On Line. This article entitled "Fooling The Spy In The Sky," from the December 1942 issue of Popular Mechanics and posted on Modern Mechanix, described the latest do-it-yourself craze of the time: camouflage research. 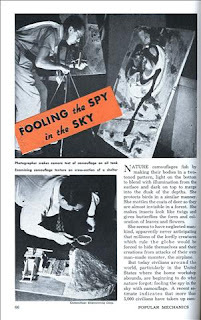 As the article explained, advances in military surveillance technology since World War I, particularly improved aerial reconnaissance, required new approaches to concealment. This morning's Sunrise Serenade was "At An Arabian House Party" by Raymond Scott. Click on the song title for a sample from emusic, or click here for the album page. The playlist for the November 2, 2011 broadcast of the Swing Shift Shuffle has just been added to the playlist filing cabinet. This morning, I learned of the passing on Friday of Beryl Davis. The British singer kept the troops entertained during the London blitz of World War II, and then came to the U.S. where she appeared with a list of swing and radio royalty, including Benny Goodman, Glenn Miller, Bob Hope, etc. The YouTube video below features Ms. Davis with Django Reinhardt on one of my favorite versions of "Undecided." Today's Sunrise Serenade was "I've Got A Feeling I'm Falling" by Ella Fitzgerald. Click on the song title to listen courtesy of Jazz On Line. The Red Hot Lindy Hop lesson and session continues this Friday night at the Rumba Room with a lesson by Matt & Kimmie and music by Kimmie. Free admission before 7:00 p.m., and $5 at the door afterwards. This morning's Sunrise Serenade was "Shout, Sister, Shout" by Lucky Millinder and His Orchestra featuring Sister Rosetta Tharpe on vocals. Enjoy the video below from YouTube.